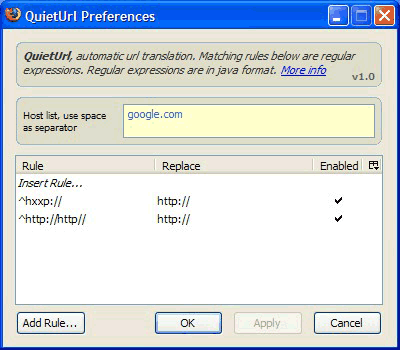 QuietUrl is a Firefox extension born to make all url-related tasks less painful, more intuitive and stress-free. Automatic anchor creation on textual url hovering (no refer) "AutoUrl"
Smart anchor creation on partial url hovering (no refer) "SmartUrl"
You can find the add-on both on the Mozilla add-on website here or, because often Mozilla is very slow in the review process, you can download the very latest version from this same website, here. Welcome to QuietUrl Extension Website! QuietUrl is a firefox extension that makes all url-related tasks less painful, more intuitive and stress-free. Main features are: automatic obfuscated or mismatched url translation, automatic url obfuscation and smooth automatic anchor creation on textual url hovering. A new version of the extension is out. Version 1.6 corrects some minor issues and adds a history control functionality reachable through the context menu when the cursor is over an anchor. Right click -> QuietUrl -> Mark as visited/unvisited. A new version of the extension is out. Version 1.5 makes all the new AutoUrl features introduced in version 1.4 more stable and accurate, increasing the chance of creating anchors where they're really needed and removing all the layout deformations which were sometimes created by the old version, also adding consistency to cross-boundary elements mixing. A new feature has also been added which makes it simpler and more immediate to navigate urls in the url bar for easy access to url sub-paths and directory trees. This can be achieved just by moving the mouse cursor over the url bar while keeping the CTRL key pressed (or the ALT key or both, by user preference). Another fast facility added takes advantage from the new Firefox 3. It's the possibility to click the icon that preceeds an url in the url list popup. This brings you immediately to the main domain of the url that icon represents (instead of the entire url) and is a very effective and fast way for accessing the home page of that website without the need to search for it in the autocomplete url list. In the last few days the website has experienced some downtimes due to various reasons, the first of which is a power outage and, secondly, the whole website has been moved on a new server. Now the issue should be fixed. A new version of the extension is out. Version 1.4 fixes the functionality of the AutoUrl feature, now all kind of textual urls can be converted to anchors, even those mixed with various text styles like bold or italics or mixed with other kind of inline elements, like spans, ems, etc. Additionally, a new interesting feature has been added, called SmartUrl, which is basically a very specialized version of AutoUrl. What it does is it recognizes url patterns for query strings and makes them clickable if some of the elements of the query string match with those in the URL of the current document. This is a very useful feature especially for websites like YouTube, where in comments it is not allowed to post full urls and so people often post partial urls that lets you access the referenced video. The new version can be downloaded in the download section of the website, here, or using the direct link: get version 1.4.0.0. A new version of the extension is out. Version 1.3 corrects lots of malfunctions and/or annoying issues in the automatic anchor generation. Also, the interface for the options dialog has been completely renewed, with some new preferences to customize all the new optimazed features like auto anchor creation and automatic url obfuscation. This version includes also a richer user interface with a status bar icon to toggle features (or the entire addon functionality) on or off with a simple click of the mouse. Some preferences have been added to control these new user interface elements too (mostly visibility at the moment). Finally the regex to generate urls has been fixed to be more selective (and now has its own interface to be edited in the add-on options dialog). The new version can be downloaded in the download section of the website, here, or using the direct link: get version 1.3.0.0. A new version of the extension is out. Version 1.1.1.3 corrects some problems on firefox 3 beta 3 for the new rules drag&drop functionality. Also some estetical/interface fixes and minimal updates. The new version can be downloaded in the download section of the website, here, or using the direct link: get version 1.1.1.3. A new version of the extension is out. Version 1.1.1.2 corrects some problems on firefox 3 beta 3. Also a small correction to the regular expression used to determine whether the cursor is over a valid url or not. The new version can be downloaded in the download section of the website, here, or using the direct link: get version 1.1.1.2. Finally the website for the extension is up and running. You can read more about the project on the About Page. You can gather more information on why and how this website was built up in the Why All of This Page. To have a look at available versions of the extension ready for download you can reach the Download Page, otherwise you can just go and download the very latest version following the Get Latest Version link.